A disjointed, dreamlike (and prizewinning) tale by Barcelona journalist Amat descends into the coca farms of Bahia Negra, Colombia. A Marxist journalist on the lam, Wilson Cervantes and his Barcelonian girlfriend, Rat, have taken refuge in a seaside farm village near his aunt Irma’s house. In the midst of a civil war, the impoverished black planters of this jungle region are at the mercy of those who sabotage the land for their own purposes: the corrupt drug dealers, who descend in airplanes to take the result of the farmers’ hard toil, the salt cocaine, and leave a paltry cut; the ruthless guerrillas, who periodically infiltrate the villages for arbitrary executions; and the paramilitary police, who routinely burn and fumigate the coca and poppy farms. “In his life as an ordinary citizen,” Amat intimates obliquely, Wilson “wrote articles that upset both the army and the guerrilla,” and yet the hot, trancelike state the two lovers fall into gradually obliterates both the reasons for their being in Bahia Negra and any motivation for leaving. Wilson intends to write a novel, yet he drinks heavily and writes nothing, while Rat observes the wacky locals, like young Aida, black Poncho’s third wife (actually his daughter), who witnesses the guerrillas murder him and loses her mind. 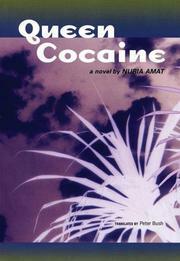 Aida reveals troubling truths about other executions she’s witnessed and leads Rat to the Dead Women’s Well, where the two watch all-night rumba parties in which coca leaves are purposefully pulverized by the intoxicated dancers for the next stage of treatment. The gathering of menacing forces against the defenseless farmers results in a violent conflagration that finally pulls the narrative out of what has seemed a drug-induced stupor. The translation is awkward, complicated by Amat’s penchant for whimsical metaphors, non-sequiturs, and shifting points of view. In all, a revelatory tale that reads like the testimony of a shell-shocked survivor.